Just like any other computer repairs, the MacBook repairs are inevitable. A few years down the line, MacBooks do show the signs of aging after all. A few of them could be the quick fixes, which you can probably address on your own if you are tech-savvy. However, in the worst case, you might have to end up paying a visit to the MacBook repair center near you. For any such MacBook repairs in Dubai, approach the Apple certified repair center in UAE, the Techno Edge Systems LLC for a dependable and authentic MacBook repair service. Nevertheless, listed below are five common MacBook problems with fixes. Check out and improve the longevity of your MacBook. 1. MacBook Boot Issues: Whenever your MacBook refuses to start-up, the ideal thing to do is let it boot in the Safe Mode. In the Safe Mode, the MacBook will be able to boot with the least number of software and drivers and at the same time runs a system check to fix any disk errors or directory issues. Solution: To force your MacBook start-up in the Safe Mode, you will need to hold the shift key while booting until the login screen appears. It may take a while before your MacBook completely boots in the Safe Mode as it runs the diagnostics at this point in time. Once it boots into the Safe Mode, in order to switch to the regular mode, you will have to restart the MacBook. 2. Incompatible Start-up Apps: Sometimes, you might find yourself looking at the blank blue screen instead of the Mac OS screen. It simply means one of the apps which is supposed to start-up automatically while booting isn’t compatible. All you need to do is identify which app is causing the trouble and remove the culprit. • Select Users & Groups. • Click your name under Current User. • Click Login Items tab. • Select the suspicious app. • Click the sign – below to hide the application from the login items. Performing the above steps will remove the app and reboot the system to check if it is logging in properly. 3. Dealing with an unresponsive app: Many times you might also encounter the apps, which when opened; your MacBook begins to freeze. Solution: You have to click on the Apple icon on the upper left corner to select Force Quit from the app. Alternatively, you can select Command-Option-Escape to get the Force Quit menu from where you can force quit the application. 4. MacBook Slowdown: Sometimes you might encounter the spinning beach ball all too often. This means your MacBook ‘s performance is sluggish. To boost the speed of your MacBook, you need to check the number of applications that are currently running on your computer. • Go To Activity Monitor. • Identify which app is consuming the most amount of CPU memory. • Highlight the app which is consuming most of the resources. • Select X button in the upper left corner. • Then Quit or Force Quit. 5. MacBook with no Internet Connectivity: If you have come across a situation when your iPhone or your iPad are connecting to the Wi-Fi without any issues and your MacBook is giving the trouble, then it’s time to fix it. • Open the Network page. • Click the Advanced button. • Preferred Networks screen appears. • Highlight your current network. • Select – to hide the network from the list. • Choose to Remove to forget the network. • Now you can go back to Wi-Fi icon in the menu bar to reconnect to the network by entering the password. 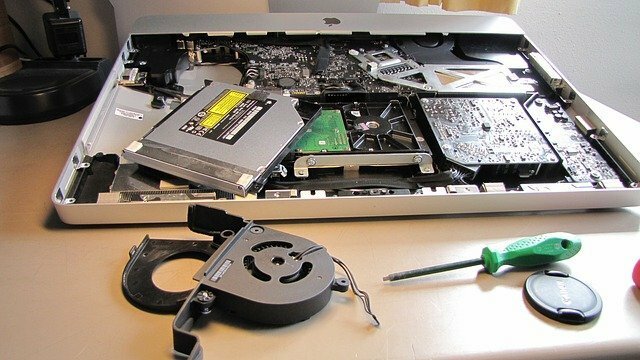 While the above five fixes might come in handy for quick MacBook repairs, for any major or common MacBook repairs in Dubai, you can approach www.ipadrentaldubai.com or contact us at +971-54-4653108.